Just as a magician can make items appear out of nowhere, the human body can manifest pain far from the cause. Cervicogenic headaches are a prime example: While you’re unable to tear your attention away from your throbbing head, the problem may actually be in your neck. Let’s take a peek behind the curtain to understand this confounding type of headache. Cervicogenic headaches are secondary symptoms of neck issues. They are triggered by neck movements and poor posture. If you sit at a computer for hours of every day, your head positioning may be causing your headaches. 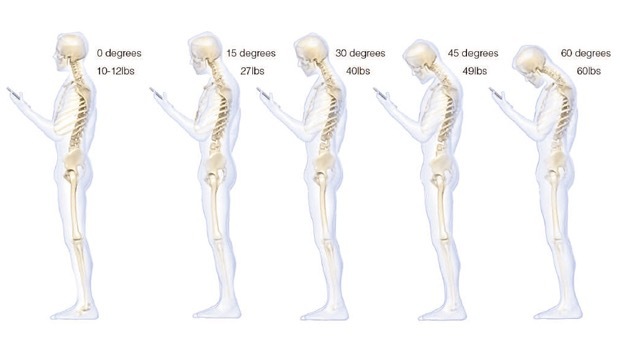 People hunched over computers and handheld devices tend to jut their heads forward, overtaxing the neck muscles and leading to spinal misalignment. Over time, this can cause the neck to lose its natural curve. A drooping head changes the amount of weight that the cervical spine must sustain. Typically, the human head weighs a dozen pounds or so. But when the head is tilted forward, the weight on the neck increases dramatically. When the chin is almost at the chest, the neck portion of the spine must hold sixty pounds—about the weight of an eight year old! If a person spends hours of every day in this posture, neck and head pain is likely. Chiropractic care can effectively treat all types of headaches. Chiropractic adjustments restore joint mobility, correct alignment and increase mobility. Ultrasound therapy, Graston Technique , and massage to the surrounding muscles provide pain relief. Together, these treatments help to create long lasting changes. A May 2013 research review found that chiropractic adjustments and neck and shoulder strengthening were the most effective ways to decrease cervicogenic pain. Here’s a simple stretch that will help you target a problem area in your neck and upper back. Place your right hand on the left side of your head and gently pull your neck toward the right to stretch the left side of your neck. Repeat on the other side. **BONUS MODIFICATION** Change the angle to pull slightly forward and toward the right to stretch your left upper back. Repeat the stretch on the left. You’ll be surprised by how much relief you can get from this one simple stretch. Dr.Carrie Staller is a Chiropractor in Portland, Oregon. Since 2008, she has been helping people find relief from all types of headaches. She was recently named one of Portland’s Top Chiropractors for 2016. You can schedule an appointment with her at Heart Spring Health or read more about her on her blog. This entry was posted in Chiropractic Medicine and tagged alternative medicine in portland, chiropractic services in portland, portland Oregon chiropractors.